It's time once again to play everyone's favorite declining real estate market game: High-Low! We start with a townhouse on White Cornus Lane. Priced at $199,900, it's the cheapest non-condo currently available in Reston. But don't think it's your typical dated Reston townhouse... it's actually brand new! Well, sort of. 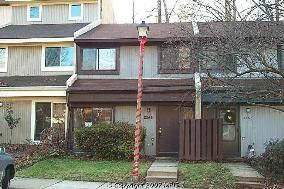 This 2 level townhouse needs just a little TLC... Update the kitchen, new paint, and carpet means new house. Priced to sell. Meanwhile, we decided to skip the usual faux-rock-faced McMansion piles around Rt. 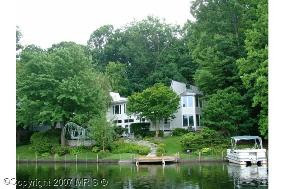 7 and looked for the priciest house within Reston proper. At $1.475 million, this house on Lake Audobon is this week's winner. 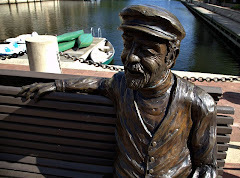 "CAPTAIN'S ROW" ON LAKE AUDUBON! THIS INCREDIBLE WATERFRONT CONTEMPORARY HOME ENJOYS SPECTACULAR "BIG WATER" VIEWS YEAR 'ROUND! RECENT RENOVATIONS INCLUDE NEWER ROOF, SIDING, WOOD FLOORS, STONE WALLS, STONE WALKWAYS, UPGRADED LANDSCAPING, NEW WINDOWS & SGDS! 2 GAS FPS! STONE PATIO & DECK WITH AWESOME VIEWS! 3-CAR GARAGE & HEATED DRIVEWAY! PRIVATE DOCK! YOUR PRIVATE RETREAT! On the plus side, you'd be able to make all your friends call you "Captain." But what the hell is a heated driveway? Can you flip a switch and instantly melt any door-to-door solicitors or illegal parkers? And we've said it before and we'll say it again: For an estimated $44,000+ commission, you'd think the selling agent could afford a keyboard with a CAPS LOCK key.